Neuritis is a general term that refers to the inflammation of the nerve. Depending on the location of the nerve, the symptoms of this condition may include localized pain, sensations of pins and needles, weakness, numbness, paralysis, wasting or disappearance of the reflexes. Neuritis can also affect the eye nerve, and when this happens the condition is known as ocular neuritis. Ocular neuritis occurs when the optic nerve becomes inflamed. Optic nerve, also called cranial nerve II, has an important role to transmit visual information from the retina to the brain. Any kind of damage to the optic nerve typically causes permanent and potentially severe loss of vision. In most cases, optic neuritis occurs as a result of an autoimmune disorder that is triggered by infection. Very often, this condition indicates multiple sclerosis, a disease in which the body’s immune system attacks its own tissue – the protective sheaths around neurons. In most cases, the exact cause of neuritis is unknown. Scientists have proposed a couple of possible solutions. Among the most plausible of all theories is the one that claims optical neuritis develops when the immune system starts to attack the myelin, a protective sheath covering the optic nerve. This process results in inflammation and gradually damages myelin, which obstructs electrical impulses which travel through the nerve to the brain. Besides multiple sclerosis, other autoimmune conditions, such as sarcoidosis and systemic lupus erythematosus, have also been linked to optic neuritis. This condition can also occur as a result of neuromyelitis optical, a disease in which the inflammation affects the optic nerve and spinal cord. Optic neuritis can also be caused by various bacterial infections, inflammation of the lining of the arteries in the head, as a side effect of radiation therapy, or because of the counter effects of certain medications. In most of cases, optic neuritis affects only one eye. Less frequently it causes problems in both eyes. The condition is characterized by eye pain that becomes even worse with movement. Most people will experience some temporary vision loss, which becomes even worse with heat and exercise. The perception of colors is also changed, and people may often complain about seeing flashing or flickering lights. In most cases, optic neuritis will resolve on its own but occasionally doctors may prescribe steroid medications to treat this condition. Typically, the intravenous steroid therapy is administered and it is usually followed by oral steroids for about two weeks. Most people will regain close to normal vision within 12 months of treatment. 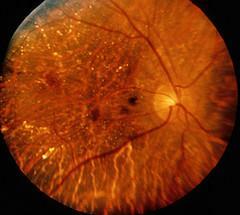 Can you tell me something about the optic neuritis?